Save 50%! on the cost of your next boat! This 1,800 page e-BOOK covers everything you will want to know about custom building an ALUMINUM, FIBERGLASS, STEEL or WOOD / EPOXY or CRUISING SAILBOAT or CATAMARAN to suit YOUR requirements. No need to accept “off the shelf ” solutions to your cruising aspirations. Glass, wood & steel building methods are all covered. You will need this knowledge to manage a building program. Written for those who want to build or have built their own power boats. Covers every possible aspect of choosing a suitable design, building in fiberglass, wood epoxy, steel or aluminum. 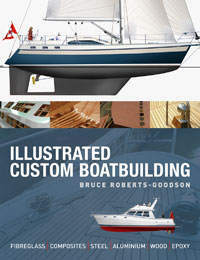 Covers building interiors and outfitting a cruising sailboat. What is an e-book ? An e-book is a book you can receive direct to your computer via a DOWNLOAD. These e-books are MOSTLY ALL COLOR .. e-books are MUCH larger than a regular book ... You can print out any special parts you want ... easy to read ... Can be UPDATED ... Costs less to produce, we can give you MORE ... Try one, you will like it ! PRICE OFFER INCLUDES ONE FREE STUDY PLAN ! First a little history. In my opinion cruising as we understand it today - that is long distance sailing in small boats for pleasure rather than for profit - began in the late 1890�s. It all started when retired sea captain Joshua Slocum found that he could not make a living out of the rebuilt former oyster dragger, the 36 ft 9 in (11.20 m) Spray Sailing Alone Around the World. In 1962 a Brisbane yachtsman affectionately known locally as �Shotgun� Spencer presented me with a battered copy of Sailing alone around the world . E H Spencer was a well-respected Brisbane businessman, who took his sailing very seriously; so seriously that during one important yacht race when another competitor did not obey the starboard rule, he showed his annoyance by diving below and appearing on deck with his shotgun and firing both barrels across the bows of the offending yacht. �Shotgun� Spencer had certainly earned his name. Barred from taking part in future races, he was something of a local hero to the younger yachting fraternity. I would like to recount those early days when I was in my twenties and had just learned to sail in one of Australia�s skiff classes. The Australian 18ft [5.5m] skiff, is an open boat with a veritable cloud of sail. The 18 footers have a smaller sister, the 12ft [3.6m] skiff. 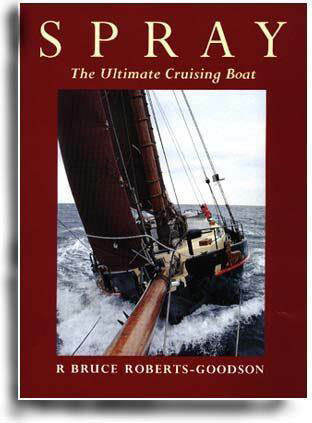 This chapter traces the history of cruising sailboats from those early days to present times. Initial planning and calculations of how much will it all cost. How to save money and keep within your budget. Budgets for acquiring your boat and for maintaining the cruising lifestyle. VAT certificates. Earn as you cruise. Your boat may play a part in your income. Chartering your boat. Setting up a workshop. Boat size for cruising and crew requirements. Where to look: new or secondhand or build? The KISS factor. Hull types, including keels and other appendages. CHAPTER 3. Choosing the Hull type. Hull types, including keels and other appendages. Selecting a hull type. Formulas and technical considerations and what they mean. Displacement length ratios and meanings. Seaworthiness, hull ends, overhangs, hull balance, self steering capabilities with and without mechanical devices Slipping your hull and the ability to go aground. Raised decks, poop sterns and anchor wells. Self steering capabilities see also rig and self steering. Underwater considerations; draft limitations, types of ballast, centre-boards, drop keels, twin keels. Rudder types; transom hung rudder. Hull construction materials; selecting the hull material and the choice between glass fibre, steel, aluminium or wood, advantages and disadvantages of each. Motor sailer hulls. CHAPTER 4. Decks and Superstructures. General configuration and layout above the deckline. Decks and Superstructure arrangements; centre verses aft cockpit, raised decks, raised foredeck, raised poop or raised mid-ship layouts. Pilot houses. Window and port sizes. Hatches; types and sizes. Deck covering. Llifelines, Pulpits and Pushpits. This chapter is an OVERVIEW of the subject of Decks and Superstructures; the actual building process will be dealt with in the individual chapters covering building in the various materials. You may already have a favourite deck arrangement; by arrangement I mean you will choose between centre or aft cockpit, trunk cabin or flush deck, open cockpit or pilot house. Perhaps you prefer a raised deck either forward, amidships or aft by way of a poop stern. The boat you are considering may have a combination of two or more of the features outlined above. CHAPTER 5. Rigs and Sail Plans. Choosing a sail plan for cruising; cutter, ketch, yawl or schooner. Modern or traditional. Unstayed rigs, contemporary Bermudian or gaff. Types of standing and running rigging. 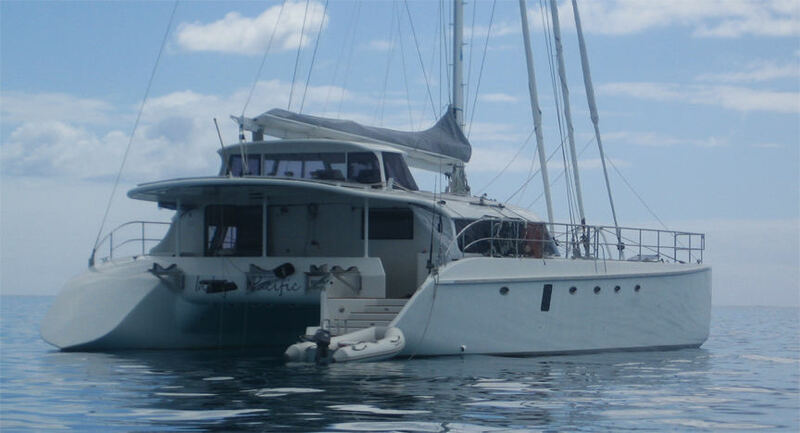 Winches, reefing systems, bowsprits. Equipment for self steering. Other self steering devices. Extra sails and their uses; storm sails and spinnakers. CHAPTER 6. Choosing a Building Site. Where to build, Area required, Tool and equipment storage. If you decide to custom build from scratch or a hull and deck package, you will need a suitable building site; this applies equally if you are building in fiberglass, steel or wood. Depending on where you live you may have many, or a limited number or choices. CHAPTER 7. Building in WOOD. During the past forty plus years that I have been associated with the building and designing of boats, wooden boatbuilding has changed in many ways. Until the late fifties, anyone who wanted to build a boat would almost always have built it in (wood) timber. At that time, fibreglass was a relatively new material and was viewed with suspicion by most boat builders. Steel pleasure boats were definitely oddities, except in the Netherlands and a few other European countries, where steel was well accepted and often more common than timber boats were in other areas. In the late fifties through to the mid sixties, due to the reluctance to accept fibreglass and the lack of appreciation for steel, At the end of the 1939 � 1945 war there was a considerable pool of skilled labor and the technology available for building timber boats using cold moulding techniques. During the war, thousands of patrol boats and aircraft were built in this manner so it was a natural transition from war to peace that many chose this material for building pleasure boats. When the war ended there was a considerable demand for pleasure boats, and thousands of cold moulded hulls were produced of which a surprising number remain in service to this day. Until the early seventies, when the Wood/Epoxy building techniques were starting to appear, most wooden boats were either carvel planked and caulked in the traditional manner, strip planked or built using the techniques of laminating multi-diagonal plywood or veneers or straight forward sheet plywood, using urea-formaldehyde or resorcinol glues and silicon bronze and copper fastenings. It would be wrong to discuss modern timber construction without reference to the glues or adhesives that make the various techniques possible. Amongst the earliest types were the urea-formaldehyde based glues which were claimed to be waterproof but it was found that water-resistant was a more realistic description. Next came Resorcinol glues, which are a phenol-formaldehyde and truly waterproof and in the early 1960�s epoxies arrived on the scene; these were the breakthrough in modern timber boat building techniques that assured longevity in modern timber boats. Interestingly, although now overshadowed by epoxies, resorcinol may be the better glue in many respects as it has superior performance at high temperatures and is less work sensitive however, the adaptability and versatility of epoxy has made it a more readily acceptable boatbuilding bonding material. Epoxies can be a glue, a resin and, with a filler, a fairing compound. Boat designers with experience in steel and aluminium will immediately notice that most fibreglass materials have lower strength and stiffness values than the metal alloys. Because fibreglass materials are much lighter than metals, thicker laminates can be designed so that the stiffness can match that of metal hulls. There are a number of types of fibre used in reinforced plastics but glass fibres are the most common because they are inexpensive to produce and have relatively good strength to weight characteristics. With the exception of chopped strand mat (CSM), reinforcements used in a marine glass fibre application usually utilize bundles of fibres oriented in distinct directions such as glass cloth and woven roving. Some are aligned in a single direction others multidirectional and the strength of the laminate will vary accordingly. here is a considerable variety of glass reinforcements but we are mainly interested in what is known as E-Glass or electrical grade glass that was originally developed for insulators, for electrical wiring, and is now used almost exclusively as the reinforcing material commonly known as fibreglass. E-glass is the most common reinforcement used in marine laminates because it is relatively inexpensive, has good strength properties and resistance to water degradation. This LARGE chapter includes details of all methods of fiberglass construction covering all modern forms of boatbuilding with this modern and well proven material. 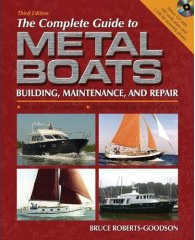 There are two main ways to build a metal boat; ln this chapter I will explain the difference between the two methods. You can NOT build a boat from a kt that is designed to be built from scratch. You can NOT build a boat from scratch that was designed to be CNC cut and built from either cutting files or a KIT. Not withstanding the above, it is possible for us draw plans or provide kits and or cutting files for scratch built boats but this is more expensive than choosing an existing kit boat. STARTING FROM A KIT or CUTTING FILES: It is now possible to purchase a kit of parts that have been precut from plate. Your job then is to assemble them into a hull, deck, and superstructure. Some designers (including this one) have the ability to prepare a special computer disk with the parts �nested� to allow more economical cutting. It�s necessary, of course, for the company producing the kit to have the automatic, computerized cutting devices. This service may cost more, but if you can afford it, you will find this a practical and perhaps even more economical way of getting your project off to a quick start. Recent cost comparisions have established that building from a precut kit or cutting files may not involve additional costs when considering all the aspects of assembling your hull deck and superstructure (often referred to as the shell). You alone can tell if the additional initial cost is justified; discuss these matters with the designer and with the company supplying the kit or cutting files. The best of these precut kits are cut from shot-blasted and primed steel that has been coated with a specially formulated weld primer. This coating doesn�t give off fumes when you�re welding. Another benefit of the weld primer is that there is little cleanup after welding; all you need to do is lightly grind the welds and then touch up the primer by hand in these areas. One thing is for sure: you�ll save a great deal of money, and end up with a boat that you are totally familiar with and can then easily maintain. 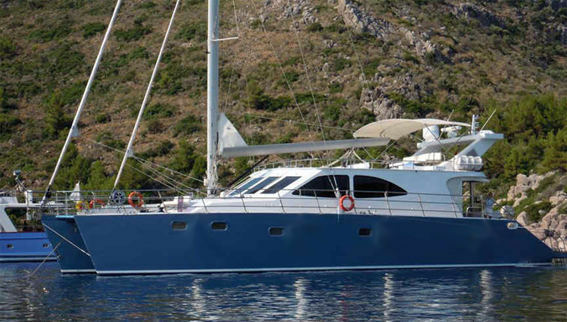 If you plan any extensive cruising, it�s imperative that you be familiar with every aspect of your vessel. What better way to learn about your boat than to work on the construction? After studying all of the options, you can personally select all the equipment you need to omplete your vessel. If your design is available as a STUDY PLAN PACKAGE then this will enable you to compare different building methods as well as to cost out the entire project. You will find that some of this chapter is slanted towards steel boats and occasionally powerboats. The principles are the same so please read this chapter in full. The same advice can be offered as if you are planning to build a fiberglass or wood epoxy boat, please read the steel chapters as well; there is much to learn and much of the material in all chapters applies to building in all materials. Glossary. Electrical installations. Domestic Batteries. Engine starting batteries. Battery chargers. Generating sets. Testing devices. Solar panels. Wind generators. Inverters Before we start to discuss your boats electrical system here is a glossary of terms that apply to this subject; usually these lists are located in appendices in the back of most books however I feel they will be of more use to you here. HOW MANY WILL IT SLEEP? When enquiring about a particular boat many people ask �how many will it sleep� and although this is a serious question it should NOT be the overriding consideration. How many will it live ? although ungrammatical, would be a more sensible enquiry. Make sure your cruising boat is set up for the least number of people you intend to have occupying the boat on a long term basis. Sometimes one is tempted to treat boats like houses; you may not need a four bedroom home other than for the resale value. Resale value of a boat is very important but the number of berths alone will never sell a boat to a knowledgeable person. As you are setting up your boat for cruising, your most likely buyer will be someone who wants to use the boat for the same purpose. If too many berths are included at the expense of other items then you will not only have suffered the inconvenience of a less than perfect layout, but you will find your boat difficult to sell when you are ready to move on. Details of sailboats in this size range that you can build in either aluminum, steel, fiberglass or wood epoxy. It recently occurred to me that safety should be spelled preparation. Many (but not all) accidents can be avoided by careful preparation and those that cannot be avoided can be mitigated by forethought planning. There are books that go into these various safety aspects in great detail; my intention here is just to put you in the proper frame of mind where you will accept that you must give safety your most serious consideration. The next step is to decide what gear and equipment is most suitable for your particular cruising needs. Types of anchors. Selecting chain and line. Anchor winches. Snubbing devices. Mooring bits or cleats. The bitter end. Dock lines and warps. Fenders. Anchor lockers. Hawse pipes. Recommended anchor weights and chain sizes. The owners of most cruising boats will be unable to afford or unwilling to pay the high insurance premiums required when long distance cruising is planned. Most long distance cruising people find that the yearly cost of insurance premiums would keep them in cruising funds for the same period. SO CONSIDER THIS A VERY IMPORTANT SUBJECT ! 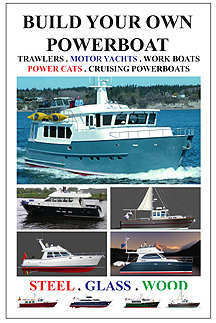 Full details on how to build your own Performance SAILING CAT or Fast POWER CAT in FIBERGLASS, ALUMINUM or STEEL + MANY STUDY DRAWINGS + STEP BY STEP PHOTOGRAPHS OF CATS YOU CAN BUILD. CHAPTER 22. Sailboats - steel & Aluminum kits. INCLUDES ONE FREE STUDY PLAN ! 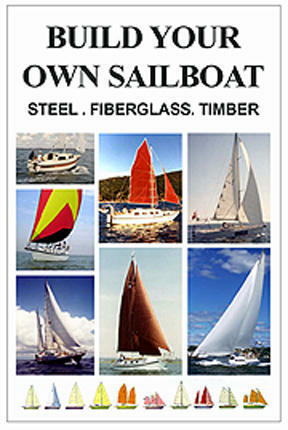 NEW e-BOOK - Now part of the e-book BUILD YOUR OWN SAILBOAT ... Full details on how to build your own Performance SAILING CAT or Fast POWER CAT in FIBERGLASS, ALUMINUM or STEEL + MANY STUDY DRAWINGS + STEP BY STEP PHOTOGRAPHS OF CATS YOU CAN BUILD. INCLUDES ONE FREE STUDY PLAN OFFER ! We recommend that you read this PRINTED hardcover book - Order now and we will pay the postage. INCLUDES TWO FREE STUDY PLANS OFFER ! over 2,600 pages all in full color.